On-air challenge: Every answer is an anagram of a geographical feature. For example: PACE --> CAPE. Last week's challenge: This challenge comes from listener Matt Jones of Portland, OR. Think of a two-word phrase commonly seen on signs in new businesses. Nine letters in all. Change the sixth letter to an N, and read the resulting letters in order: You'll get a new two-word phrase sometimes seen on humorous signs in classrooms and offices. What signs are these? Challenge answer: Now hiring --> No whining. Puzzle winner: David Jernigan of San Antonio, Texas. Next week's challenge, from listener Janet McDonald of Baton Rouge, La. : Take the initials and last names of two opposing historical figures. Add a C and mix all the letters together. You'll get the title and last name of another historical figure from approximately the same era. Who are these people? If you know the answer to next week's challenge, submit it here. Listeners who submit correct answers win a chance to play the on-air puzzle. Important: Include a phone number where we can reach you Thursday, Dec. 22, at 3 p.m. ET. December is in full swing. Snow, ice and freezing wind hit a lot of cities across the U.S. this week. And if you live somewhere cold, you may be wondering - is there really any reason to go outside at all? Heck no. Stay inside and play The Puzzle. CHANG: Of course, I'm joined by the puzzle editor of The New York Times and WEEKEND EDITION's puzzlemaster Will Shortz. WILL SHORTZ, BYLINE: Good morning, Ailsa. CHANG: So remind us, what was last week's challenge? SHORTZ: Yes, it came from listener Matt Jones of Portland, Ore. I said think of a two-word phrase commonly seen on signs and at new businesses, nine letters in all. Change the sixth letter to an N and read the resulting letters in order. You'll get a new two-word phrase sometimes seen on humorous signs in classrooms and offices. What signs are these? Well, the first sign in new businesses is now hiring. Change the R to an N and you get no whining. CHANG: We got over 1,200 correct answers this week. And the winner is David Jernigan of San Antonio, Texas. DAVID JERNIGAN: Thank you very much. CHANG: So how did you figure out the answer? JERNIGAN: I have to say it came to me immediately because just a day or two before The Puzzle had aired, I saw that sign in a restaurant window. So I guess it was still fresh in my mind, and soon as I heard the first half of the clue, I thought, oh, now hiring - I saw that sign. And then, of course, it fit. CHANG: So what do you do in San Antonio? JERNIGAN: I work for a local nonprofit health insurance plan. I'm a compliance manager. CHANG: OK. Do you have a question for Will? JERNIGAN: Yes, I do. 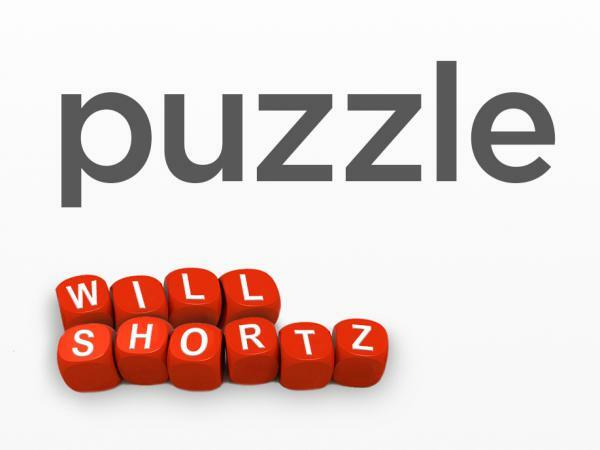 I'm wondering, Will, since you're so immersed in the world of puzzling, do you ever have any kind of anxious dreams about having to create a puzzle on a tight deadline or not being able to solve a puzzle? SHORTZ: Well, it's a good question. And no, I never have any anxiety dreams about making puzzles or solving them. CHANG: That's a lot of pressure. SHORTZ: ...And I don't. Yeah. CHANG: That's a lot of pressure. All right, David, are you ready to play The Puzzle? CHANG: All right, Will, let's do this. SHORTZ: All right, David and Ailsa, every answer today is an anagram of a geographical feature. For example, if I said pace - P-A-C-E, you would say cape. Number one is kale - K-A-L-E.
SHORTZ: Yeah. In this case, water. JERNIGAN: Oh, a lake. It's a lake. SHORTZ: Lake is correct. Number two is same, S-A-M-E.
SHORTZ: Yeah, something you'd see in the Pacific. SHORTZ: That's it. Canoe, C-A-N-O-E.
SHORTZ: It's somewhere you might take a canoe if you were adventurous. JERNIGAN: If you have it, Ailsa, go for it. I'm still trying to figure it out. CHANG: I'm still stumped. I'm staring at the letters here. One more hint, Will. SHORTZ: Ocean. No hint needed. Ocean, nice. CHANG: That would not be me in the ocean in a canoe. OK.
SHORTZ: I said if you were adventurous. CHANG: ...You are so good at this, David. SHORTZ: And here is your last one. Real force - R-E-A-L-F-O-R-C-E - and the answer is two words. The first word has five letters, second word has four. C is the first letter. JERNIGAN: I think you got me on this last one. SHORTZ: Uh-huh. What if I told you the second letter is O? SHORTZ: Coral reef is it. CHANG: Oh, my goodness. David, you are a superstar at this. Great job. For playing our puzzle today, you will get a WEEKEND EDITION lapel pin as well as puzzle books and games. And you can read all about it at npr.org/puzzle. Tell us, what's your public radio station out there? How do you listen to us? JERNIGAN: It's KSTX, 89.1 FM, right here in San Antonio. CHANG: All right. David Jernigan of San Antonio, Texas, thank you so much for playing The Puzzle. JERNIGAN: Well, thanks and happy holidays to you both. CHANG: Likewise to you, too. All right, Will, what is the challenge for next week? SHORTZ: Yes, it's a very elegant challenge, which comes from listener Janet McDonald of Baton Rouge, La. Take the initials and last names of two opposing historical figures, add a C and mix all the letters together. You'll get the title and last name of another historical figure from approximately the same era. Who are these people? So again the initials and last names of two opposing historical figures, add a C, mix all the letters together, you get the title and last name of another historical figure from about the same era. Who are these people? CHANG: When you have the answer, go to our website npr.org/puzzle and click on the submit your answer link. Just one entry per person, please. And our deadline for entries is Thursday, December 22, at 3 p.m. Eastern. So include a phone number where we can reach you at about that time. And if you are the winner, we'll give you a call, and you'll get to play on the air with the puzzle editor of The New York Times and WEEKEND EDITION's puzzlemaster Will Shortz. Thank you so much, Will. SHORTZ: Thanks a lot, Ailsa. Nice talking with you.